Turns Out I Married Superman! My apologies for my absence this week. 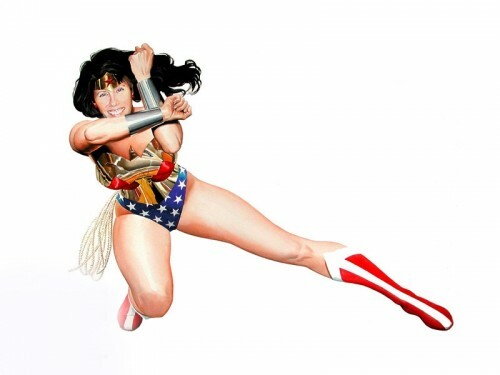 I have a really good excuse though…turns out I married Superman! Yep. 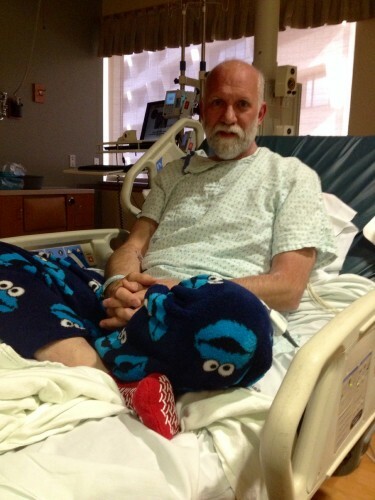 That’s Mike in his Cookie Monster pjs in the St. Al’s ICU. Looks pretty good for a guy who had A STROKE just 42 hours before I took this picture doesn’t he? I told you…Superman! We had been working in the yard, putting up some reed fencing along the last portion of chain link fence beside the garage — it was hot and he kept greying out but he didn’t want to stop (of course). After that was done he mowed the lawn including portions of our “meadow” which had gotten too long and started to yellow. When he finished he was bending over to pick up a clump of grass and felt (and heard inside his head) a “pop” like when you pop your knuckle. That pop was his carotid artery dissecting spontaneously (you can google “carotid artery dissection”). He put the lawn mower away and came inside to take a shower, but he was seeing a weird visual affect over his right eye like a dandelion puff or sometimes a mesh-like waffle pattern. He was acting sort of strangely so I kept asking him what he needed and he was getting less and less coherent. He took his shower and had a sandwich and got out his computer and then things happened really fast. First he couldn’t get his left hand to type his password. Then he couldn’t feel his left foot. By now I’m saying “do you need to go to the hospital? Are you having a heart attack? Can you walk?….We ARE going to the hospital!” and somehow I got him into the car — his whole left side was going numb but he was mentally slowing down and sort of observing himself (he told me later) while I was going into hyperdrive. I got him to St. Al’s in 7 minutes. Once we were at St. Al’s and two men got him out of the car and into the emergency room the ER doc told me he was having a stroke. About 10 people were working on him at once, and after they shaved his chest and wired him up and shot him full of something and whisked him off for a CT scan and I’d been advised of all the probable next steps — major clot busting drugs, possible surgery, etc. — they wheeled him back in — and he was back to his old self. The paralysis in his left side was gone, the slurred speech was gone. It was like nothing had happened. At this point everybody started shaking their heads and saying things like “fluke” and “lucky” and “never seen this before” and “you’ll be very interesting to the doctors on their rounds” and nobody actually said “miracle,” but that’s what I’m thinking. Mike spent 48 hours in ICU, then they moved him to the medical ward on the third day and he was released because he’s willing to administer his own blood thinner injections until he can rely on the Coumadin alone to keep his blood at the proper thickness that will not form clots. Besides taking the meds he is not allowed to lift anything heavier than 5 lbs. for the next 3 months. Everything, except for Lula, weighs more than 5 lbs. He’s going to rest through the weekend and then play it by ear next week, but probably not ride his bike in until the week after. He’s mostly tired now, and a little paranoid — when your body does something spontaneously like split an artery and the doctors can find no reason why it happened you wonder when the next bizarre thing is going to happen. As I write this it is “the weekend” and Mike is feeling better and better. His energy is coming back and with it the desire to lift heavy things and leap tall buildings in a single bound. Lucky for him, his choice of mates was equally…super!